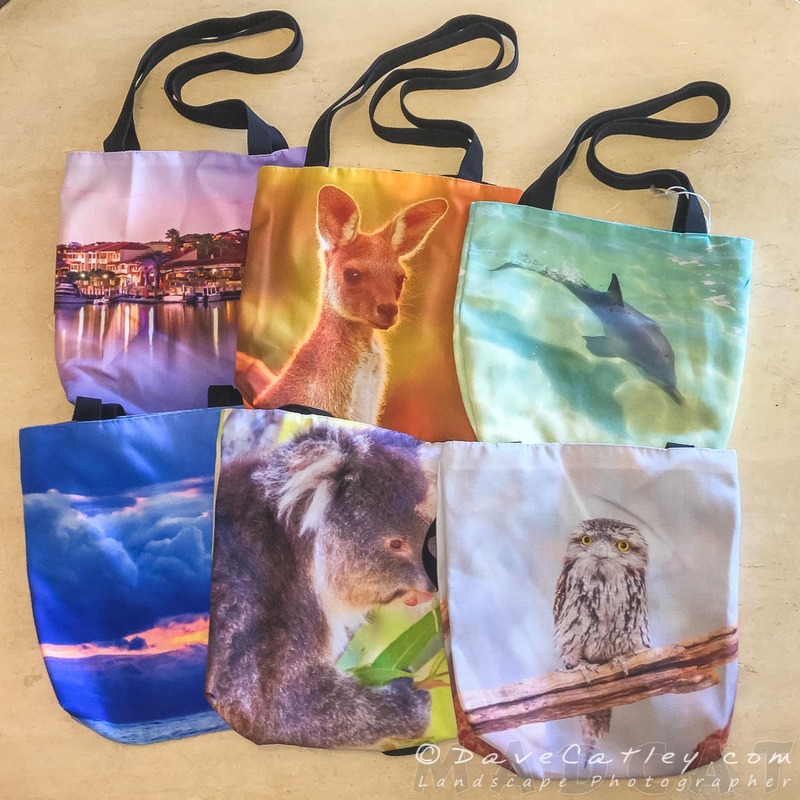 Our Unique Photographic Printed Tote Bags Featuring Beautiful Images from Western Australia make great Valentines Day gifts for her. At only $29.95 they are great value but stock on hand is limited so get your orders in now to avoid disappointment! 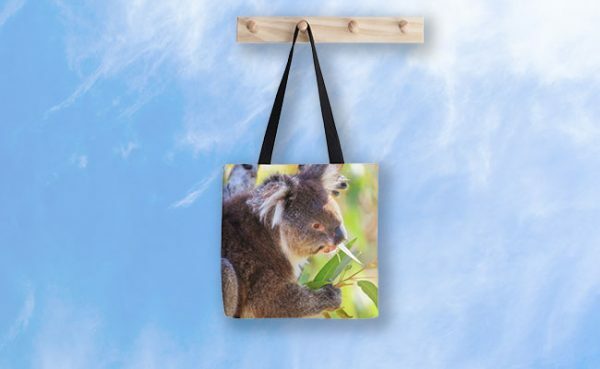 These designs and more are available at https://madaboutwa.com.au/product-category/tote-bag/. These Tote Bags are 33cm x 33cm and the image is featured on both sides. Larger sizes and designs are available, check it out at https://madaboutwa.com.au/product-category/tote-bag/. Available for pickup in Mindarie or Mail Order, please check with Australia Post for delivery schedules to your area. There is always someone on your gift list that is hard to buy for. Whether they have everything or they are just hard to please it is always a struggle to find just the right thing. 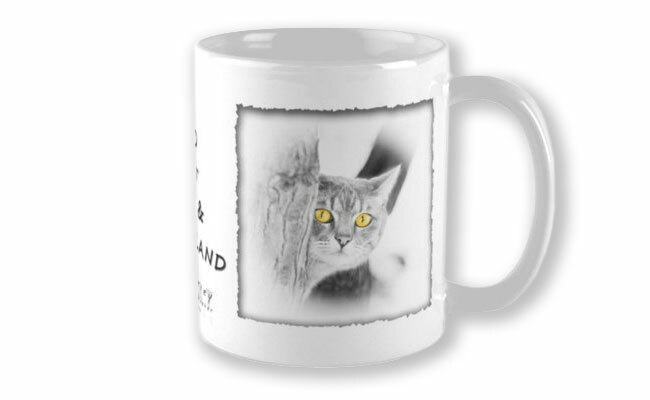 What if you could get them something personal that you cannot just buy in the shops that will make an unforgettable present. We can help you do just that! 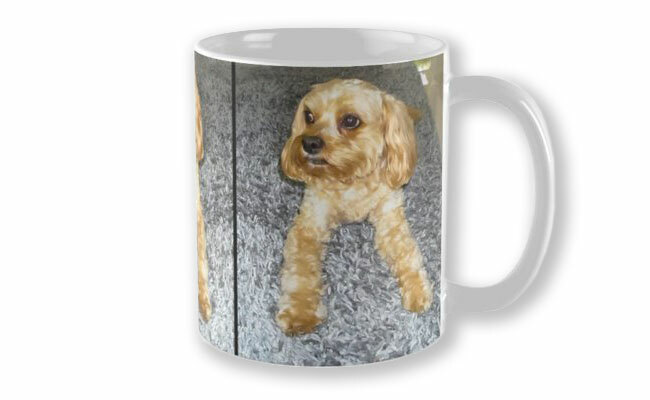 Why not get them their favourite pet, family members or favourite scene printed as Personalised Photo Gifts! 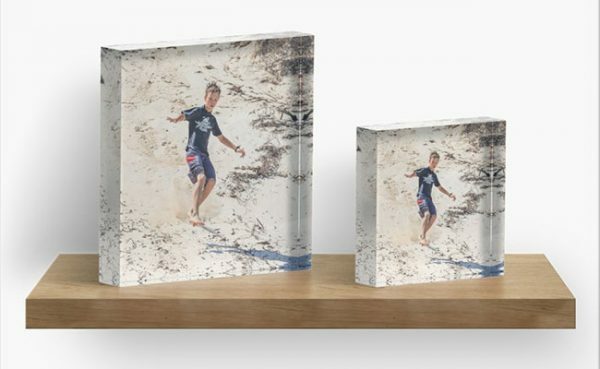 Thanks to the suppliers we use we can print one off Personalised Photo Gifts without it costing an arm and a leg, just a little time. All you have to do is send us the image that resonates with your loved one, the products you wish it to be printed on and we will do the rest. Please allow between 2-4 weeks for manufacturing. Times depend on the products ordered. Express postage will reduce Delivery times for an additional fee. We will provide you with an estimated time of delivery at the time of ordering. Provided there are no unforeseen incidents our estimates are generally very accurate, but we will be sure to keep you up to date with the progress of your order. I would like to say a big “Thank You” to everyone who came and visited me on Sunday at the MEGA Indoor Market, you help to make it Another Great Market Day! I love the travelling stories you tell me and describe to me your favourite places to visit, adding to the bucket list of places we should go. Deep in the Forest, Tamborine Mountain Scarf, one of the items sold on the day! 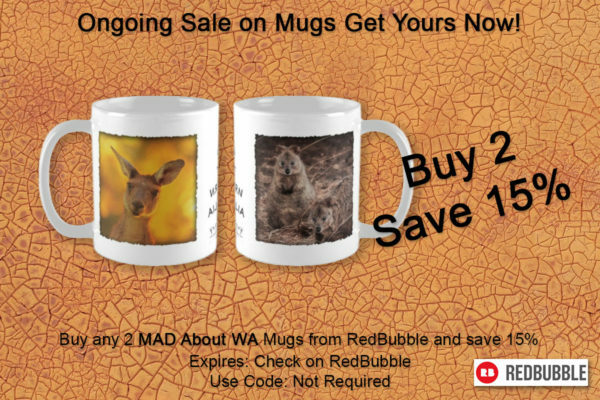 If your not telling me travelling stories you are talking about a native animal that adopted your family and the antics they get up to, reinforcing our feeling that our native wildlife is second to none. I would also like to thank Linsey and Luke from Linsey’s Community Events for organising a great event! 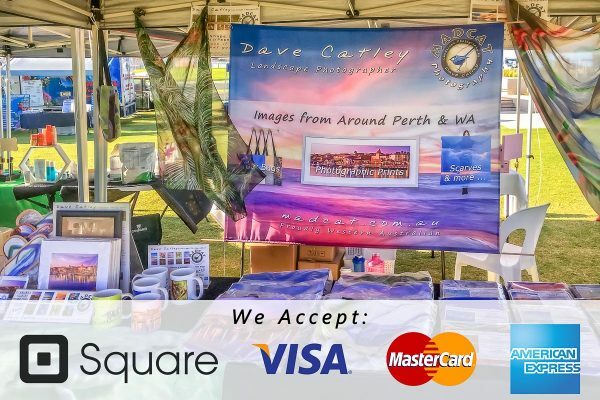 Now we have been going to markets for about 3 months we have decided to get an EFTPOS machine for our shoppers convenience. 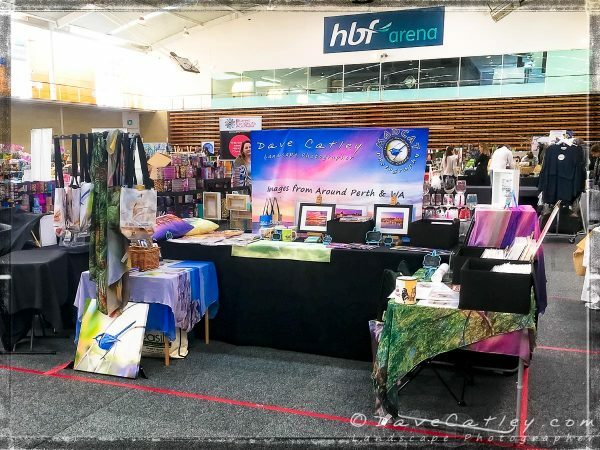 We realised that most people only bring enough cash for their fresh food purchases so it simplifies things if we can take Pay Pass, Credit Cards and EFTPOS. The other great thing about the solution we have chosen we can SMS or email you a receipt on the spot. 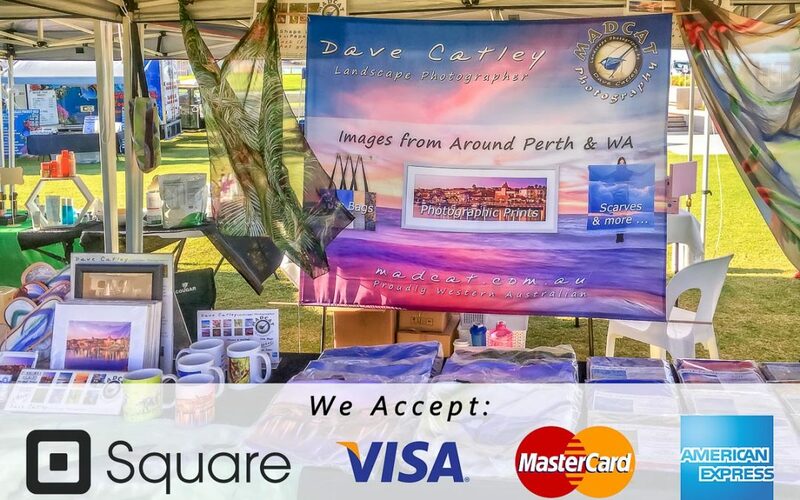 If you are a small business and would like a low fee option then we can recommend SquareUp. For under $50 you can buy the hardware, which connects to your mobile phone and signing up for an account is free. You can purchase the hardware direct or you can buy it in OfficeWorks. Having EFTPOS has definitely made a big difference to us and I have found SquareUp to be simple to use and we get paid within 1 business day. 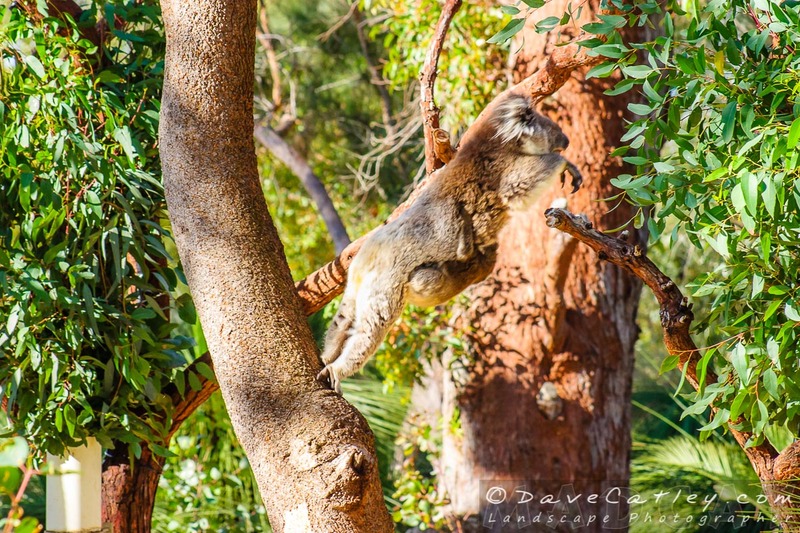 A visit to the Yanchep National Park is not complete without wandering through the Koala enclosure spotting the koalas in the trees. Most of the time they are high up in the trees and fast asleep but sometimes you will get lucky and spot one who is a bit more active. 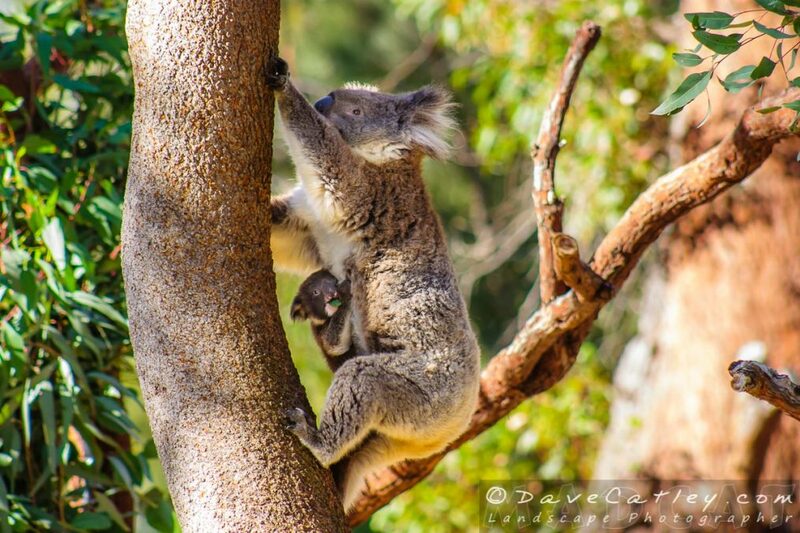 Mum decided to move from her perch up in the trees, with baby hanging on, “Do I go up or down”. I wonder what’s over there? Hold on tight Joey! Although I do not have the photographic evidence she landed safely with Joey still attached I assure you she did. Dave took these pictures back in 2004 during the early days of MADCAT Photography. The photos where processed using Lightroom CC and ON1 Photo 10. Koalas are listed as vulnerable and are only found wild in Queensland, New South Wales, Victoria and South Australia. The Australian Koala Foundation, Save The Koala Website has some great information about the fight to save our wild Koala Population, you can even adopt a Joey (a baby Koala). 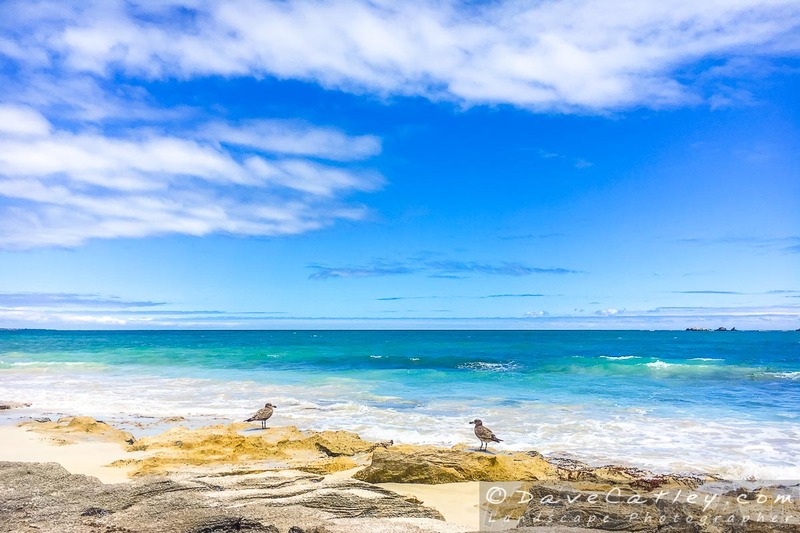 We have been visiting places around Perth where you may have to drive for between half and hour and an hour but you don’t have to go far to see some amazing sites around Perth including a relative of the albatross. 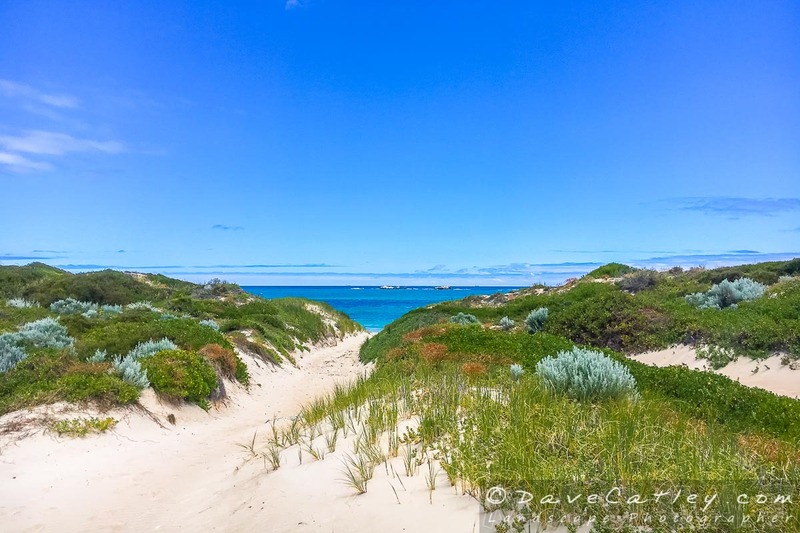 Take the other day when we decided to go to Burns Beach and walk up the beach North towards Mindarie, we often walk from Mindarie but we thought we would check out the beach from the other direction. We did not have to walk far to be greeted by the wonders of our oceanic birdlife so here are a sample of the sights to behold. 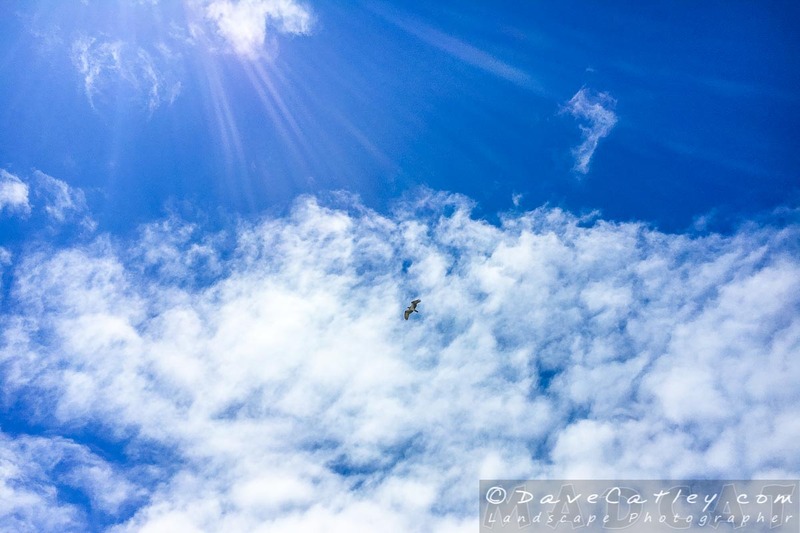 Osprey flying high above Burns Beach, hunting the dunes. A pair of Petrels on the rocks enjoying the waves, they let us get pretty close. Petrels are related to the Albatross as mentioned above. Sooty Oystercatcher with the most amazing red eyes and red beak, foraging for food on the edge of the waves. Provided you tread carefully and do not frighten the wildlife they will reward you with a fairly close encounter, just remember to give them space. For the more adventurous you can wander into the dunes, just don’t get lost! Sand dunes near Burns Beach that stretches all the way to Mindarie and across to Marmion Avenue. I recommend getting out and communing with nature, there is plenty of sights to encourage you to go around the next corner and before you know it you will be fitter and more relaxed! 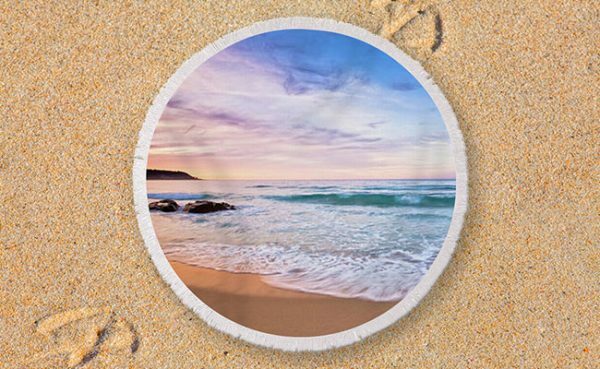 Don’t forget the sun is getting stronger and the temperatures are rising, take plenty of water, wear a shirt, put on sunscreen, take a hat, anyone remember Slip Slop Slap. Whiteman Park is a great place to take the family for a fun day out soaking up the sunshine. 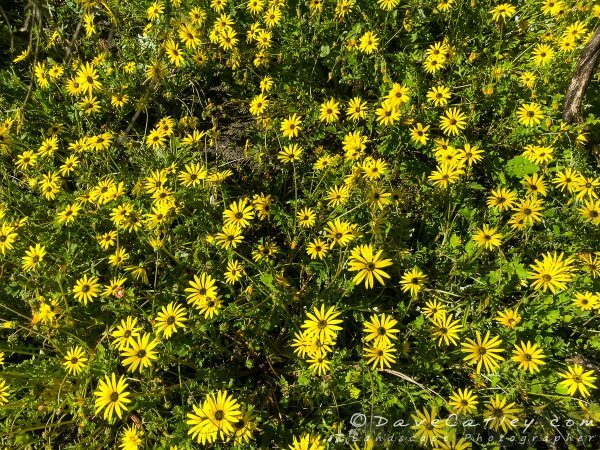 If, however, you are prepared to take a walk along one of their well marked trails then spring is a great time for wildflower spotting. Dave and I decided to go out to Whiteman Park to walk the Wunanga Trail which is the longest walk trail in the park at 4.3 km long. Wunanga is a Noongar word meaning ‘quiet’ or ‘peaceful’. The trail is well marked with Yellow/Orange topped pine poles some of which have a letter on top. Each letter refers to notes on the trail guide giving you more information about the area you are walking through. 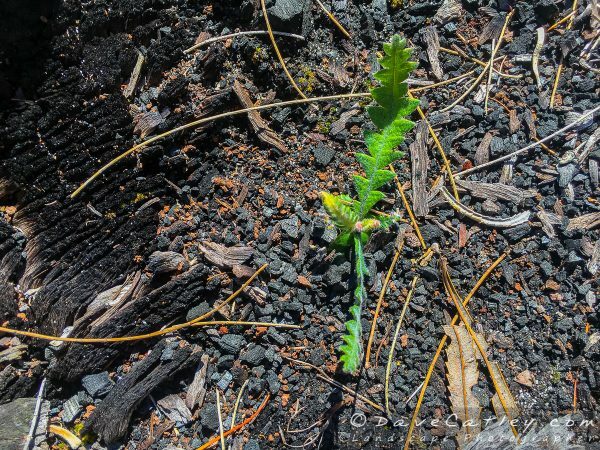 Here is what I found that caught my eye. Not exactly a native wildflower but very pretty all the same. 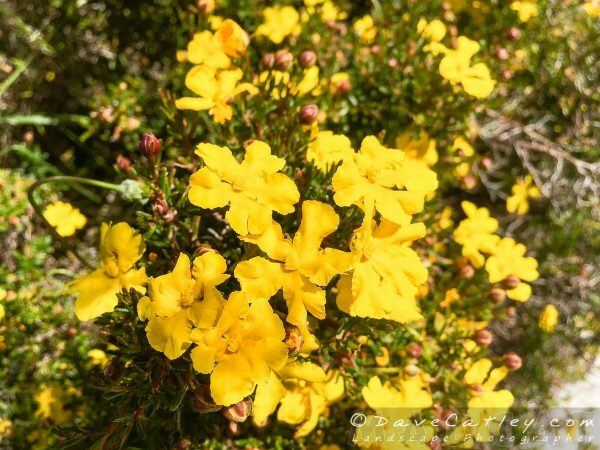 These bushes are very common and absolutely covered in these gorgeous yellow flowers. What looks to me like a white orchid but I cannot find a reference to it anywhere. Another array of yellow flowers, beautiful! New growth showing from the burnt out remains of what once was a giant Jarrah tree, nature always prevails. Came across this bobtail lizard, nearly stood on him, if you look closely you can see my footprint! I took a few more pictures but I am still learning and they were not sharp enough for public display. 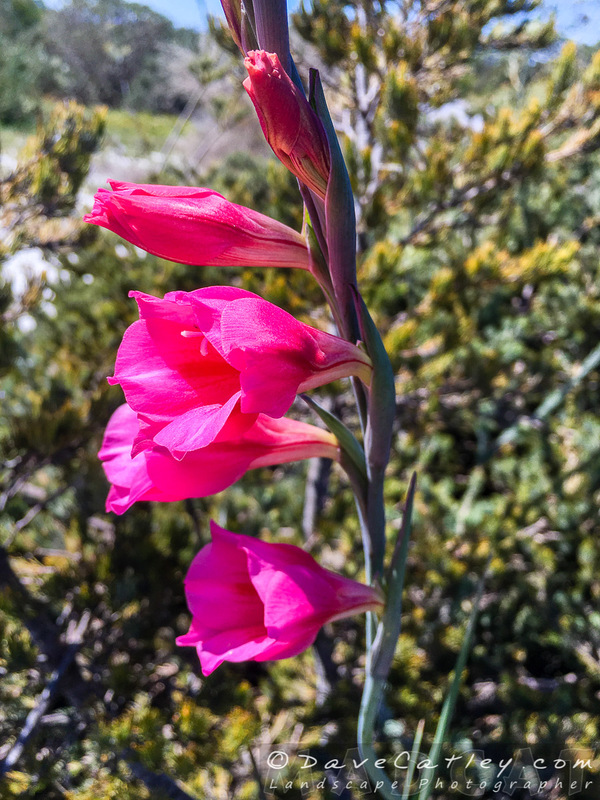 For those knowledgeable botanists out there, please feel free to leave a comment and help me identify the flowers above, especially that white one! 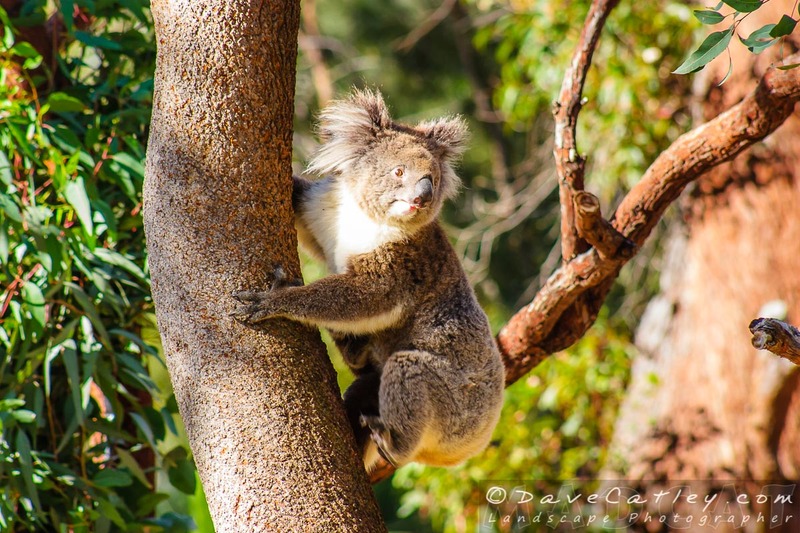 Just from these few pictures alone I hope you will be encouraged to visit Whiteman Park and get off the beaten track and walk one of the walk trails. Please remember to dress appropriately, slop on the sunscreen, slap on a hat and carry plenty of water. 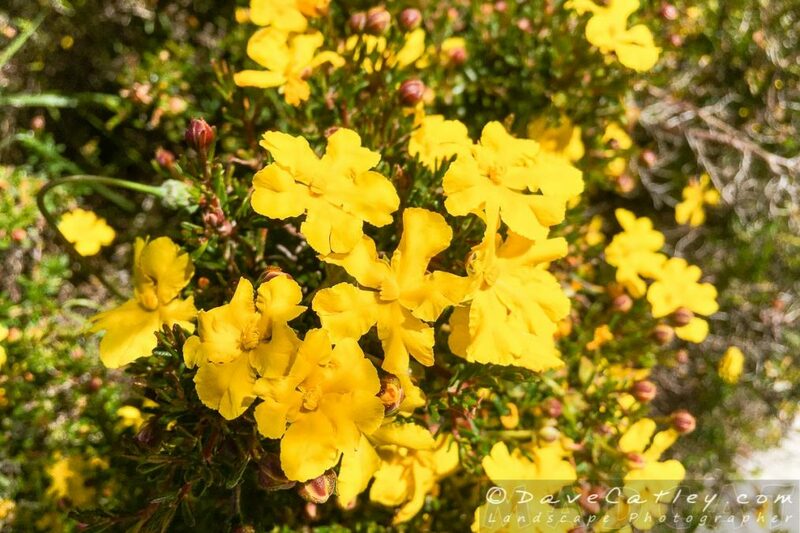 Dave will be posting Part 2 of this blog with lots of amazing pictures from the walk and some great photo tips. 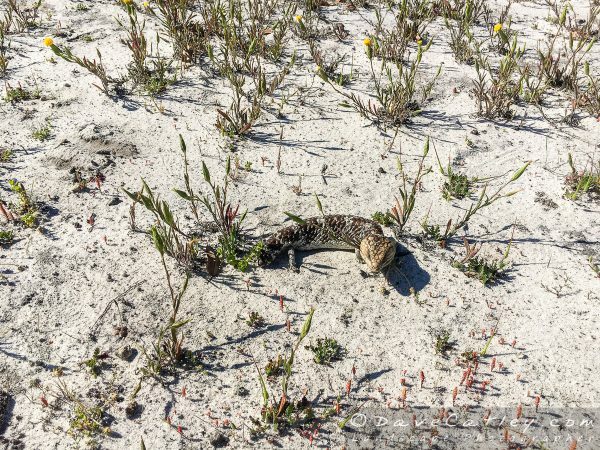 When visiting natural environments such as this please be respectful of the flora and fauna, take your litter home and treat the environment with respect. 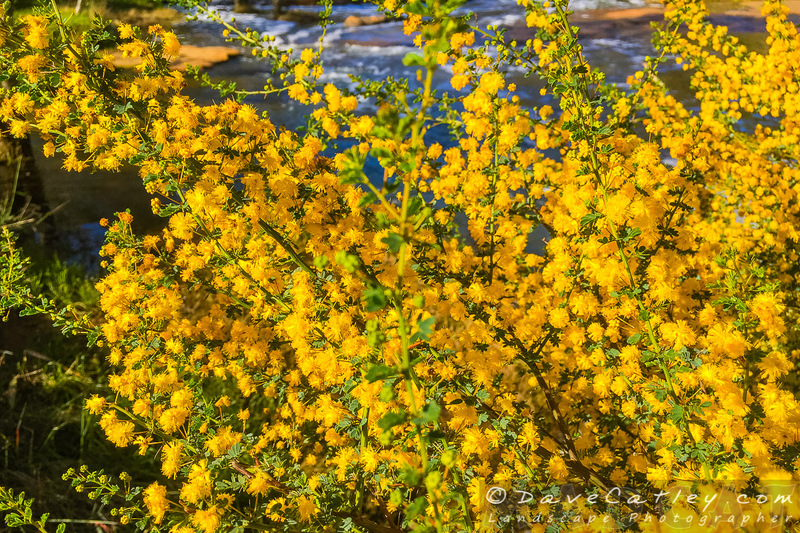 Dave will have some more photo tips in Part 2 of this blog series. All images in this article were taken on an iPhone 6s by me and processed in Lightroom CC. You will need to post process your images to get the most out of them. Software tools such as Adobe Lightroom & On1 Photo 10.5 are affordable and essential for getting the best out of your photos. 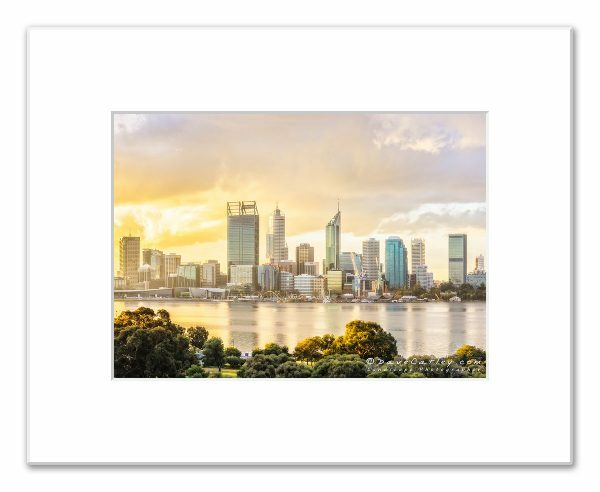 As usual we’re planning a whole range of clothing & products featuring our “Whiteman Park” images. More details in Part 2 of this blog series. Meanwhile you can take a look at all of the amazing images and products that we currently have available in our shop, all based on Dave’s photography. 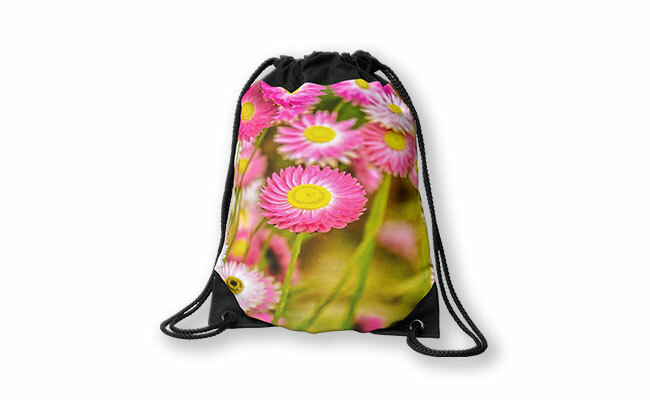 Everlasting Daisies, Kings Park Drawstring Bag design by Dave Catley featuring Kings Park Everlasting Daisies available from our MADCAT.RedBubble.com store. 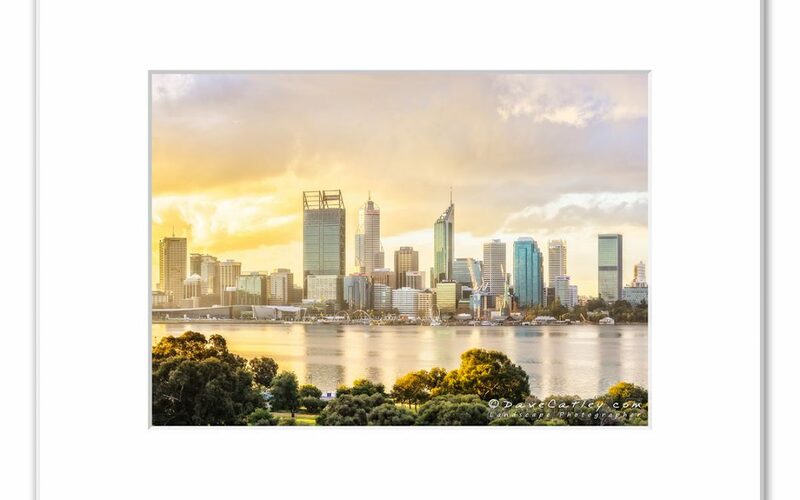 Whiteman Park is located to the west of the Swan Valley with entrances from Lord St & Beechboro Rd and is 18 km northeast of Perth. Now is the best time to visit our waterfalls. As winter ends and spring begins the water in our waterways is about as full as it is going to get. We decided to take advantage of a beautiful sunny day to visit Noble Falls in Gidgegannup and enjoy the site and sound of fast running water. Another great thing about this time of year is it is wildflower season and the wattles are in full bloom, a sight that only lasts so long. There are also plenty of other wildflowers to see along the walk trail here. The Noble Falls did not disappoint either, with fast paced running water rushing over the rocks as can be seen here. 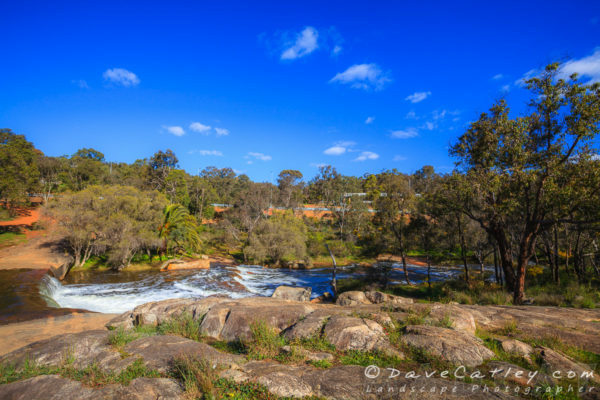 You can also see how close to the car park and picnic area Noble Falls is, so if you’re not up for a walk then you can still enjoy the views. 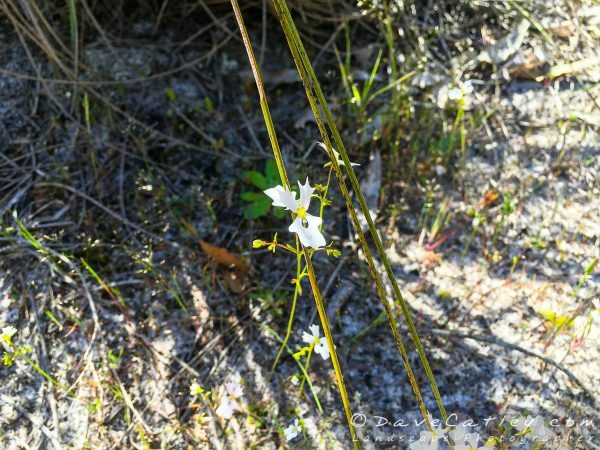 There are 2 walk trails at Noble Falls, a short 1.3 km loop and a longer 3.5 km loop. Both trails offer a very scenic walk along the river and through the surrounding bushland returning on the far side of the river. We took the longer trail and really enjoyed the walk and the views. If after a walk along the Wooroloo Brook you have developed an appetite then there is a picnic / barbecue area near the falls or the Noble Falls Tavern just across the road, where we had a great lunch. 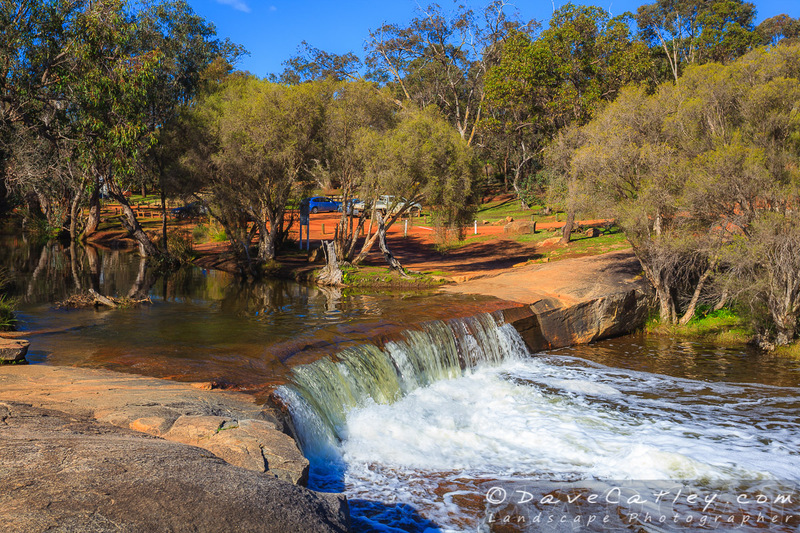 If you love waterfalls then may we also suggest a trip to John Forest National Park, Sixty Foot Falls and Lesmurdie Falls to name a few great days out. 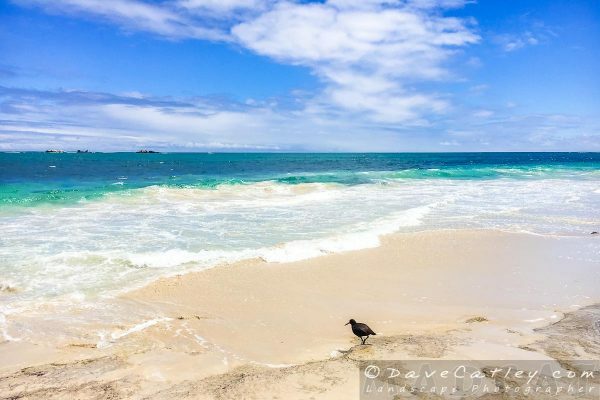 Dave will have some great photo tips in Part 2 of this blog series. All images in this article were either taken on an iPhone 6s or with Dave’s Canon 5D MKII with an EF 17-40mm f/4L USM Lens or an EF 70-200mm f4L USM Lens and processed in Lightroom CC & ON1 Photo 10.5 & Photoshop CC. 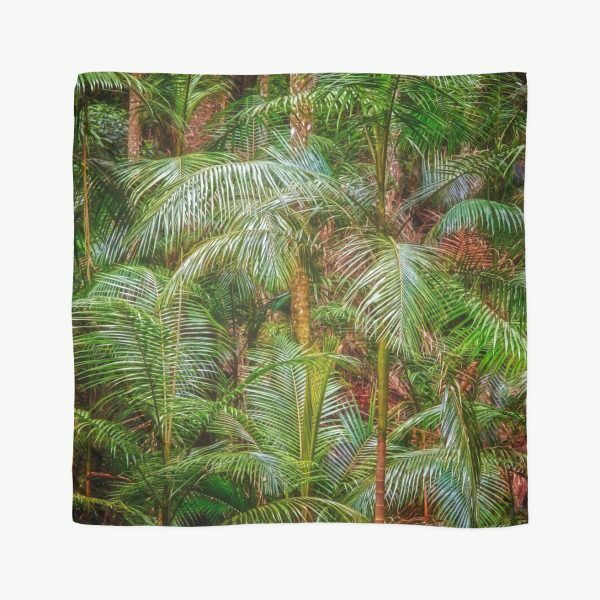 As usual we’re planning a whole range of clothing & products featuring our “Noble Falls” images. More details in Part 2 of this blog series. 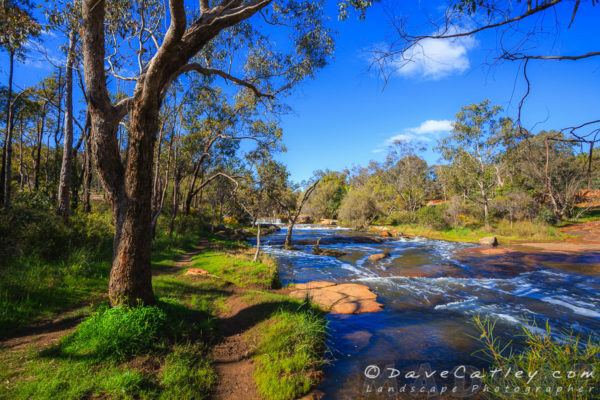 Noble Falls is located just off Toodyay Road in the township of Gidgegannup, City of Swan approx 40 km northeast of Perth.